Perific Ergonomic Mouse & Trackball | OhGizmo! Here’s a mouse that strives to improve the ergonomics of ‘mousing’ rather than cram in a handful of useless other functions no one really needs. Variation is the name of the game when it comes to minimizing the risk of repetitive strain injuries, so the Perific Ergonomic Mouse can be used in several different ways throughout the work day. With the easily removed shell attached, the Perific funtions and is used just like any other standard desktop mouse. When the shell is removed though the Perific can be held in your hands in any position while mouse movement is handled by a trackball. There are also two sets of left and right buttons which facilitate the different ways the mouse is designed to be held and used. To make switching ‘modes’ even easier the Perific mouse functions wirelessly relying on a base unit that connects to your computer VIA USB which can also be used for charging. 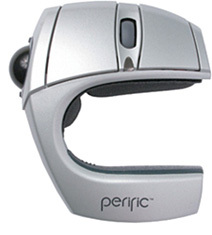 The Perific Ergonomic Mouse & Trackball is available from The Human Solution for $119.00. far from perfect….what about Left handers…this is completely useless for lefties! !